We would like to inform you that the case you reported about（32762XXXXXX) is no longer available. Thank you for your help in bringing this matter to our attention. Thank you for contacting AliExpress. I am sorry to hear that you are not satisfied with your order 82329504XXXXXX. Important: All evidence and information should be uploaded to the dispute details (pictures and videos). Evidence or information on other websites or the message history will not be accepted. If you can not upload the evidence - please let us know. Notice: Dear customer, we are sorry to learn that you received defective product form the seller. We will do our best to help you. As the product is not completely out of use, we cannot execute a full refund. Thank you for your cooperation and understanding. Wish you can have a nice day. 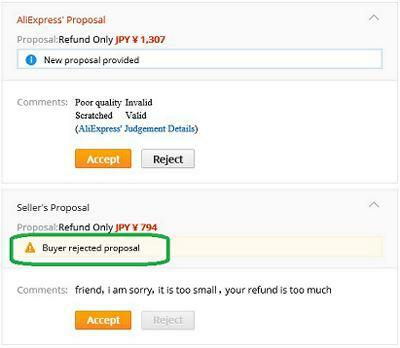 Note: If you have already settled the dispute with seller, please kindly give a response in the dispute detail page so that we can be informed and follow this dispute based on the settlement. If you fail to choose or reach an agreement with seller within the response time, option 1 will be executed.